Whatever circumstances that attracted you to this opportunity, one thing is certain, there are many other people just like you that want to work at home. No matter what you do for a living – you find yourself thinking, “there must be a better way, a less complicated way, a smoother road” – the opportunity to work at home and run your own International Trade business can be the answer you have been looking for. WBE.NET Study Materials and Learning Support will guide you step-by-step on how the export process works, and help you develop a strategy so you can start your own business putting trade deals together. Work-at-home internet businesses are the wave of the future, and trade is one of the oldest and most lucrative businesses in the world. Imagine the power we have with the internet to reach potential buyers and sellers in foreign countries with a single click; reach markets you never knew existed. 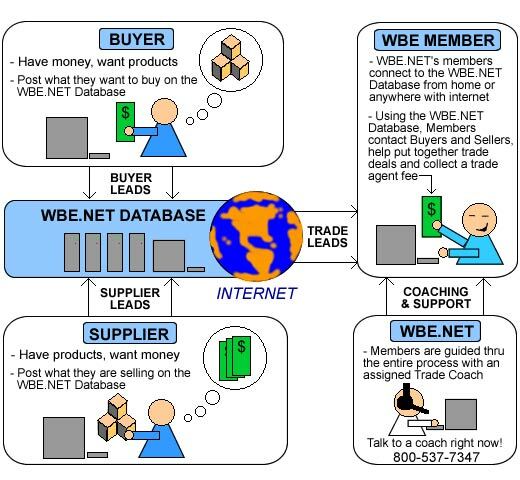 Learning to export with WBE.NET is the work-at-home solution for your internet business venture. Start your trade business today, receive learning support from WBE.NET trade experts, promote the export of U.S. goods to help boost our economy, and work at home with The World Business Exchange Network. Call toll free 800.537.7347 and let one of our trade experts answer any questions you might have before getting started.